The Plant is a biannual journal offering plant lovers a new look on greenery by featuring the works of photographers, illustrators and designers who share their love of plants. Previously the magazine had been produced in Spain but they wanted to reduce the costs, while improving the quality of production. Issue #12 features a subtle redesign, involving larger pages, the logo in the masthead debossed, and the cover paper changed to a smooth, uncoated stock. We looked at each element of the production process to see where value could be added, and to identify where cost savings could be made. In order to reduce the costs of production, we suggested that the binding change from thread sewing to PUR. We suggested various uncoated paper stocks and provided white paper dummies. They did not want to lose the premium aesthetics of the more expensive uncoated stock, so we suggested that we had the paper sheets ‘made to size’, resulting in less waste and more efficient usage of the sheet. This enabled The Plant to use a more creative but expensive material. In addition, in order to increase the collectability and provide additional intrigue, we suggested that the magazine could have two different front covers for the same price as printing one. Some of the cost savings were used to cover the cost of debossing the masthead, creating a truly elegant and more eye-catching front cover. A 200# screen and plate profile specially developed for the uncoated material was used for the production. Proofs were supplied as hi-res Epson proofs on uncoated paper and sent to both London and Barcelona. Adhering to ISO12647 colour management targets, we accurately matched the signed-off proofs while the customer passed the cover and the first two text sections on press. Print production, folding and binding were completed in-house, while a member of the production team supervised the debossing on the cover at the outworker. Printed Pages is an edit of the most interesting work and features that ‘It’s Nice That’ have published online over the previous six months; a 240-page magazine that brings together the best from the creative world. All of the features are brought to life with vivid and eclectic illustration and photography, commissioned specially by It’s Nice That’s in-house creative team. Park Communications were brought in to contribute to the creativity and maintain high quality production standards within strict time and budget constraints. Edel Rodriguez, the Cuban-born, American-raised illustrator, is well known for his magazine covers depicting Trump, many of which have become icons of protest around the world. His cover illustration for Printed Pages S/S18 channels this, depicting a series of eyes tracking the artist’s name and the cover line “made you look”. We proposed embossing the cover with a heavy sand grain emboss. The embossing added tactility much more cost effectively than using a textured stock, and by doing so, we were able to achieve more detail, lift and vibrancy in the printing. To add intrigue, and to mix up the pace and rhythm of reading, different pages sizes were used. We prepared white paper dummies, using a range of different material and page size combinations, to enable It’s Nice That to choose the optimum result for their design. At our suggestion, the solid black article headings were converted to print as 4 colour in order to obtain a more dense black. In addition, we neutralised the monochrome imagery to ensure the images maintained a consistent colour when printed. A 200# screen, plus image and plate profiles specially developed to achieve the best results on each of the materials, were applied. Digital book proofs and hi-resolution Epson proofs, on both uncoated paper and coated material, were provided. Adhering to ISO12647 colour management targets, we accurately matched the signed-off proofs on press. Print production, folding and binding were completed in-house, while a member of our production team supervised the outworker’s lamination and embossing of the cover. SODA Review is a magazine showcasing the design process, strategic thinking and crossover forms between architecture, design and brand environment. The publication launched during spring 2018 and has been entered for the 2018 Design Week Awards. SODA Studio have a meticulous eye for detail, a passion for materials and above all, a drive to create. They wanted a printer who could provide the same attention to detail, a passion for all elements of production, and the drive and experience to realise the creative potential of the independent style magazine. We had to keep to a tight budget while keeping quality standards high. Being involved from a very early stage, our strategy was to review each element of the production process to see where value could be added and cost savings could be made, without sacrificing quality. The magazine takes different elements of the SODA Studio’s branding and uses them throughout, so it was important that colour consistency and accuracy of binding were to an extremely high standard. We suggested various mixes of coated and uncoated paper stocks and provided paper samples, so that they could choose the options that best conveyed their design. To add interest and creativity, we proposed and priced a number of different front cover options including different laminations, foiling/varnish options and different embossing finishes. The SODA Studio team chose to laminate using our tactile soft-touch option and then to spot gloss UV varnish the masthead so it stood out on the cover. Colour profiles specially developed to achieve the best reproduction on the Indigo press were used to maximise printing quality. Proofs were supplied as PDFs for content and final hi-res Indigo book proofs and we accurately matched the signed-off proofs. Print production, folding and binding were completed in-house, while a member of the production team supervised the spot gloss UV varnish on the cover at the outworker. 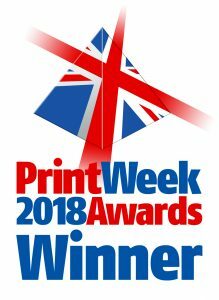 And finalist in the Digital Printer Awards 2018.